Elkhart In. : Dr. Miles Medical Co. , 1902. 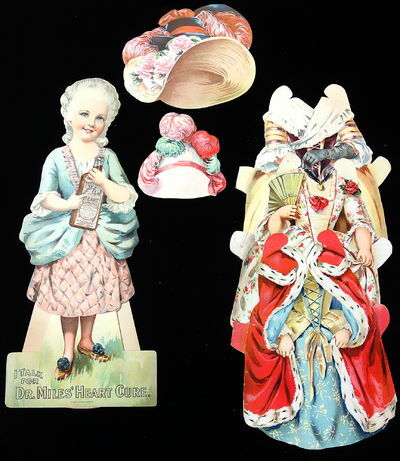 A 20 3/4" tall die-cut easel back paper doll depicting Katrina Knickerbocker holding a bottle of Dr. Miles New Heart Cure. The reverse introduces Katrina, a character in Rip Van Winkle and of course promoting the various Dr. Miles with brief narratives and a complete product listing including pricing. Also includes three costumes and hats. The costumes are identified e.g. for a stroll on the Bowling Green. Each costume has product information on the reverse.